Stone vs cedar fence – comparison chart. Natural look of stone. Fence can be customized during building process and multiple elements could be added to design for creating unique fence style. Beautiful look of wood. 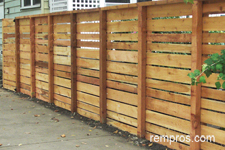 After installation cedar fence could be stained or painted in any desired color. Good choice for installation around residential and commercial properties. Solid stone fence is an excellent security barrier. Cedar is a good material for building security fences. Stone is a great material for building privacy fences. Depends on fence design, but wood is a good option for building privacy fences. One of the most impact resistant fence. Cedar fences have good resistance to impacts, but could be physically damaged much easily compare to stone fences. Cannot be damaged by termites or insects. Termites can damage the cedar fence. Stone is one of the most durable fencing options. Cedar fence is fairly durable. 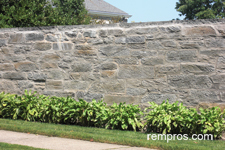 Proper built and adequate maintained stone fence can last over 100 years. Cedar fences have much shorter lifespan compare to stone fences and typically should be replaced in 15 – 20 years. Poorly maintained cedar fence might not even last 10 years. Stone fence normally do not require much of a care besides regular cleaning. Cedar is a high maintenance fencing material. Stone fence is extremely expensive. Cedar is one of the most affordable fencing options. Charges to build one linear foot of stone fence are significantly higher compare with any other fencing options. Labor fees for cedar fence installation are much lower in comparison with building stone fence. Building a stone fence is a complex task which requires skills and experience. Installation of a cedar fence is one of the easiest tasks. Building 60 – 65 feet of 72” high stone fence is 4 - 6 days project for an experienced crew. Crew of three normally is able to install 70 - 75 feet of cedar fence in couple days. Depends on damage. Stone fence repair could be a challenging task. Cedar fence is easy to repair. Cedar and stone are both good fencing options with their own advantages and disadvantages. Cedar is very easy to work with material and wood fence is very affordable what makes it very attractive to many homeowners. Stone fence has great sound absorption ability, much longer lifespan and superb durability, but due to its high initial cost many property owners choose cheaper cedar compare to investing dozens thousands into expensive stone fence.